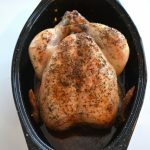 1 roasting chicken – I usually buy small roasting chickens from Costco, and they usually weigh between 4-5 lbs. Rub the chicken with a couple tablespoons of olive oil. Sprinkle on your favourite savoury herbs. I like to use rosemary, sage, and thyme. Bake in a 350 degree oven for approximately 2 – 2 1/2 hours (or longer), this is for a small roaster chicken weighing about 4-5 lbs. Just make sure the internal temperature is between 160 – 165 degrees.